Your roof is without a doubt one of the most expensive home repairs or replacements that you will make. And while most Phoenix roofs are designed to last from around 20 years (for shingle roofs) to 100 (for tile and some foam roofs), having the best warranty you can get is extremely important. You might pass when asked if you want an extended warranty for your new digital camera, but if you have to replace that, you will probably be out only about a few hundred dollars, whereas a new roof may cost you thousands in repairs or tens of thousands even for a completely new roof. To make sure that you get the most from your roof and your specific warranty we have compiled some information to give you a better understanding of the different types of roof warranties and how to make them work for you. The manufacturer’s warranty is the most common type of roofing warranties. This type of warranty protects against product defects that may have been caused because of manufacturing error, faulty material or other flaws the manufacturer may be responsible for. Most manufacturer’s warranties protect your Mesa shingle roof for a limited time span such as 20, 30, 40 or even 50 years. However, this only applies to problems with the roofing material itself and applies to instances when the shingles break down or fail before they should. We always caution to pay special attention to manufacturer’s warranties and to make sure whether their limited lifetime warranty only applies to the original owner of the roofing material. In this case, if you have purchased the home with the shingles already in place, the original manufacturer’s warranty may be void and you should look into purchasing additional insurance policies to protect your roof (and bank account). Many manufacturer’s warranties do not transfer with home ownership. Additionally, sometimes the manufacturer requires the homeowner to prove that he or she has been maintaining the roof properly or else the warranty may be void. Ask your Mesa shingle roofing professional about the manufacturer’s warranty on the product he uses and what to look out for. This type of insurance is backed by your local roofing contractor himself and protects against sub-par workmanship, faulty installation or other work-related problems. The duration of the warranty can vary from roofing company to roofing company, while some offer one to two years installation warranty, other roofing companies truly stand by their work and word and offer lifetime warranties. 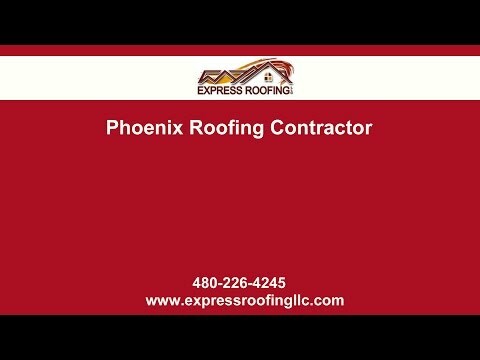 With these types of warranties for your Phoenix roof install, it is important to check the fine print. Is the warranty transferable if you sell the home? Do all the future roofing services have to be performed by the installing contractor or are other contractors allowed to work on it. And it is always important to work with a reputable and long-established roofing company such as Express Roofing LLC, because you won’t benefit from a lifetime install warranty from a roofing company that may be out of business within the next few years. Maintenance and certain upkeep tasks are required by the manufacturer to guarantee the warranty will stay intact. The manufacturer’s warranty covers only manufacturing defects not normal wear, tear and usage problems. Does the warranty only cover materials in case of faulty materials or the labor to replace it as well and does it cover both replacement and repairs or just one of the two? The best advice we can give you is to read your warranty in depth and to keep in mind that manufacturer’s warranties are designed to protect the manufacturer and rarely the homeowners. For this reason, Express Roofing LLC only uses roof materials from top manufacturers with stellar products and the best warranties in the industry. If you are unsure about what actions may void the manufacturer’s and/or installation warranty of your new roof, check with your Phoenix roofing contractor, he will be more than happy to answer your questions. Contact us to learn more about our roofing services and the fantastic warranties we offer or to schedule a consultation with our professional roofers.